Jeff Kind summed things up perfectly with just a few words. Middleton committed 30 turnovers and missed 12-of-19 free throws last Friday — and won. As sloppy as it may have been, the host Cardinals never trailed and defeated Madison East, 47-36, in the season-opener for both teams. Middleton has now defeated East five straight times, dating back to the 2016-17 season, which included the Cardinals beating the Purgolders in a sectional final. Middleton beat East twice last season with two separate one-point victories. Failing to qualify a relay team for the state meet would have been a devastating blow to most programs. But Middleton girls’ swimming team isn't like most others. 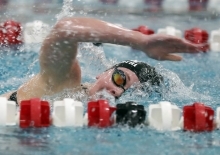 Instead, the Cardinals used it as motivation and put on a dominating display en-route to their third consecutive WIAA Division 1 state swimming and diving championship at the UW Natatorium last Saturday. Middleton finished with 249.50 points – 61.5 points ahead of second-place Cedarburg with 188. Sun Prairie finished third with 170 points and Verona /Mount Horeb took fourth with 169 points. MILWAUKEE — The WIAA boys state volleyball tournament moves from Wisconsin Lutheran College to the Resch Center in Green Bay next year. Middleton, for one, can’t wait. The Cardinals reached the state tournament for a sixth consecutive season — the second-longest streak in the state. But for the sixth straight time, Middleton was ousted in the first round. Kenosha Indian Trail rallied from a 2-1 deficit and upset the Cardinals, 25-22, 23-25, 23-25, 26-24, 15-9, last Friday. Middleton finished its stellar season 35-6 overall, but like its recent trips to state, also exited with a hollow feeling. Middleton coach Ben White agreed. Jeff Kind read the book ‘Legacy’ this past offseason. And Middleton’s girls’ basketball coach immediately knew what the theme was going to be for his 2018-’19 Cardinals. The book tells stories about champions doing extra, how they handle pressure and what their secrets to success are. And Kind has stressed them all since beginning practice last week. Middleton, which opens its season by hosting Madison East Friday at 7:30 p.m., now hopes to create its own legacy this winter. These Cardinals certainly have a chance to do just that. As the adage goes, nobody is perfect. But don’t tell that to coach Lauren Cabalka and Middleton’s girls’ swimming team. The two-time defending WIAA Division 1 state champion Cardinals are within reach of a third consecutive perfect season. Cabalka said the Cardinals’ will to win is strong. Senior captain Hannah Aegerter, the team’s lone top seed at state, said Middleton won’t give up its championship hopes without a fight. There was joy, euphoria, happiness and delight. Then came confusion, bewilderment and frustration. Middleton’s girls’ swimming and diving team — the two-time WIAA Division 1 state champion — won its own sectional last Saturday. The Cardinals won the meet with 317 points, while Sun Prairie was a close second at 312. Madison West (291), Verona-Mount Horeb (289) and Madison Memorial (250) rounded out the top five. It should have never been that close, though. Middleton’s 400 freestyle relay team — one that would have contended for a state title — was disqualified for false starting and is now ineligible to compete at the state meet. “It was incredibly tough to end the meet with a disqualification to our 400 free relay,” Middleton coach Lauren Cabalka said. “This is one of the top relay teams in the state and certainly would have contended for a state title. Middleton’s boys’ volleyball team has done it again, and this time they did it in dramatic fashion. For the sixth year in a row and the 11th time in school history, the Cardinals are headed to the WIAA Division 1 state volleyball tournament at Wisconsin Lutheran College in Milwaukee. Top-seeded Middleton rallied from a 2-1 deficit and notched a thrilling, 25-16, 19-25, 21-25, 25-21,15-8 win over third-seeded Kettle Moraine in a sectional final held last Thursday at Madison Memorial High School. Middleton is just the third team in Wisconsin history to make it to the state boys volleyball tournament six consecutive years. Waukesha (1950-1961) and Marquette University High School (2002-2018) are the others. The Cardinals’ 11th state appearance is now tied for the fifth-most appearances in state history. Middleton’s girls’ volleyball team didn’t enjoy quite the level of success it was hoping for in 2018. But the Cardinals still brought home some postseason awards. Senior outside hitter Lily Welti and senior middle blocker Hannah Flottmeyer were named first-team all-Big Eight Conference. Senior outside hitter Keller Frinzi was named second-team all-conference, while senior setter Rachael Roberts and senior defensive specialist Olivia Farin were named honorable-mention all-league. Welti led the Cardinals with 260 kills, a total that also ranked fourth in the Big Eight Conference. Welti was also first on the team with 350 digs, which ranked seventh in the league. In addition, Welti was fourth on the team in aces (31) and third in serves received (366). “Lily was one of our tri-captains,” Middleton coach Franco Marcos said. “She was our go-to player. She led our team in kills for the last three seasons. Ben Kollasch was hoping for more. Middleton’s boys’ soccer coach guided a team that finished second in the Big Eight Conference this season, its best finish in six years. But when it came to all-conference voting, the Cardinals didn’t have a single player earn first-team honors. The Cardinals did have eight players recognized. Senior forward Andrew Lund, senior midfielder Bryce Schuster and junior defender Peter Tuttle all received second-team all-conference honors. Junior keeper Ben Scher, sophomore forward Ezra Joseph, senior midfielder Greg Pauly, along with junior defensemen Cian Carlson and Blake Kalscheur all received honorable-mention all-conference honors. There’s just one problem when you’re No. 1. There’s nowhere to go but down. Everybody guns for you. The target on your back is the size of Montana. Middleton’s boys’ cross country team found that out the hard way last Saturday. The Cardinals had a sensational performance at the WIAA Division 1 state meet where they finished second overall behind champion Neenah. Just one problem. Middleton — the defending state champions — expected to be first again. So when the final scores went up on the board at The Ridges Golf Course in Wisconsin Rapids, Middleton’s reaction was predictable. Middleton senior standout Caleb Easton agreed.